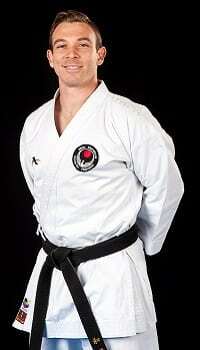 Senpai Hintzel began training in February of 1993 at the age of 4, studying Matsubayashi-ryu in Mason, Ohio. Travis’s parents enrolled him in karate to help with his discipline and focus in school. At the age of 17, he became the youngest student to obtain his black belt at his dojo. His educational studies led him to Dallas, Texas where he also began studying Wado-ryu at the Academy of Classical Karate; earning his black belt in 2013. Travis graduated from University of North Texas with an accounting degree in 2013. He currently runs his own business while teaching classes at Academy of Classical Karate in the evenings. He has had the opportunity to serve as both a competitor and a coach on the competition team. He holds a Safe Sport coaching certification and has an enthusiasm for training. In addition to his experience as a coach, Travis is a seasoned instructor with 8 years of teaching experience, working with both youth and adults. Travis holds a Nidan certificate in Matsubayashi-ryu and a Senpai certificate in Wado-ryu karate. He is very passionate about helping young people to find their potential in martial arts and in life through the study of karate-do.